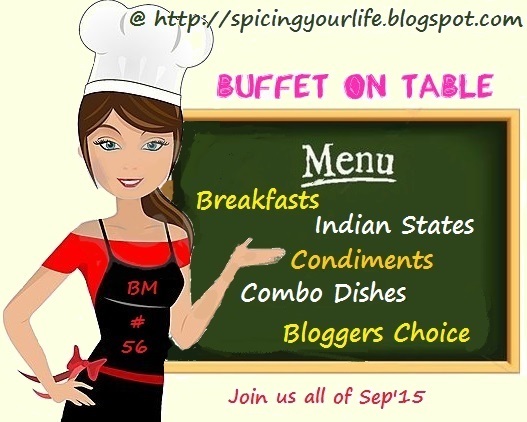 We are entering into the second week of BM Mega Marathon for Sep, featuring a Buffet on Table. First week was all about serving combo dishes. Second week features Indian States. Now as many of you know, I am very fond of the Indian Thali Concept. Many of the Indian States have their traditional and authentic way of serving a lunch course. I even had a Mela on Indian Thalis for which many of my friends went over the board and cooked up many delicious and unbelievable thalis of different states. I had made some thalis myself, for some I tried covering the entire course. Still have some states that I was planning to make. That was some years ago and even then it was impossible to expect the entire 15 - 20 dishes to be completed in one sitting. Now I find there are hardly any takers for such an elaborate meal. Thalis are mostly served for lunch as its heavy. Or as in south, when cooked at home, its mostly brunch. When one cooks up a feast, its mostly on a festival occasion. Different families follow different festival customs. 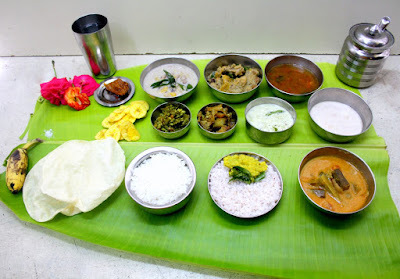 In our home, I have noticed Amma following different Lunch menu for different festivals. Right from sweets, savories, the lunch menu also varies. I have tried my best to follow all that. However with young children at home, it is nearly impossible. So when we decided to have Indian States, I was again and again going back to my addiction of thali. We had enough time and planning to make these ahead. However as always with life catching you up, I was left to handle this at the very end. I was almost not sure if I would be able to make it. I confirmed with all the elders at home, if I can go ahead making this and knowing their love for Kerala food, atleast my parents, I went ahead. To read about how I went ahead preparing the Onam Sadya, read the preparation post. Planning the Onam Sadya Menu helps in you cooking up the dishes quickly. 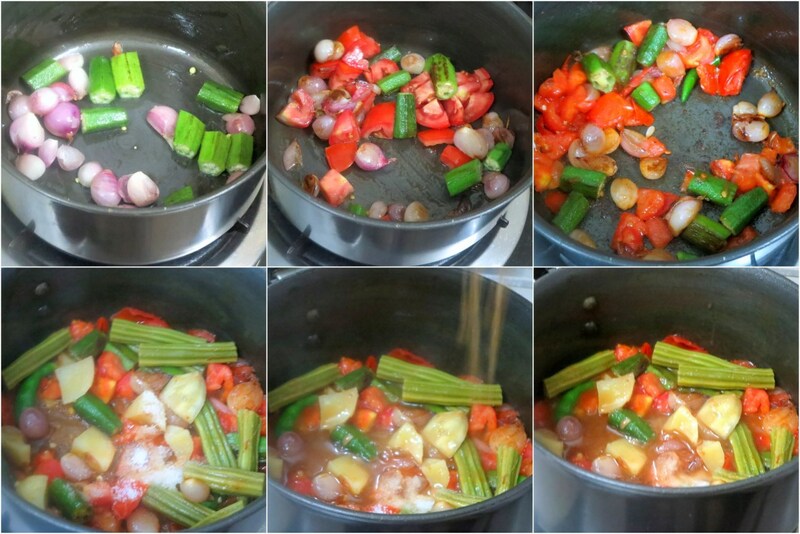 Since all are simple vegetarian dishes, you can cook many within short time frame. 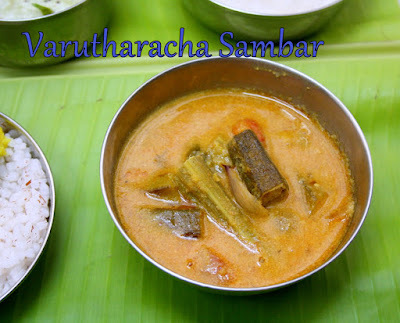 For any South Indian meal, Sambar is a main dish to be featured. Sambar is made with Toor Dal/Yellow Pigeon Pea along with vegetables, Tamarind and Tomatoes. 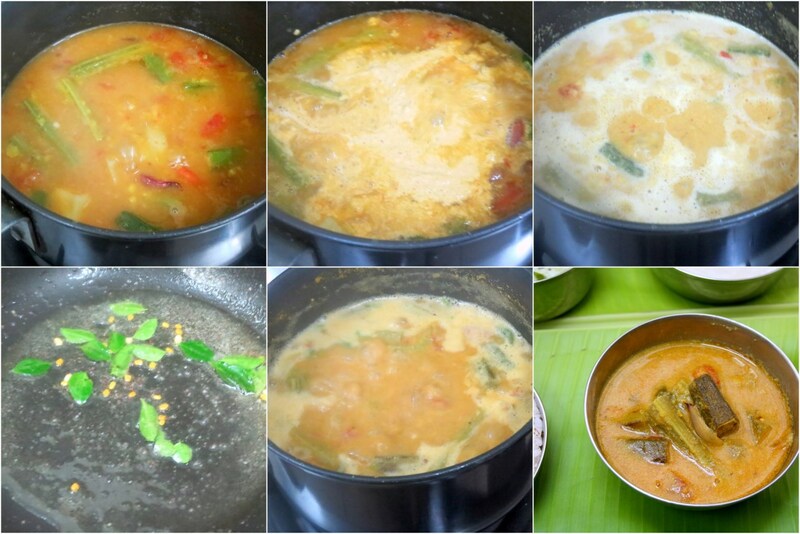 However each state has its own characteristic lent to the sambar. In Kerala, it is made with coconut and coconut oil. Wash and pressure cook toor daal with water, turmeric powder for 3 whistle or till softly cooked. Mash well. MW potatoes, drumsticks for 5 mins each. Soak the tamarind in hot water and extract the pulp and keep it aside. 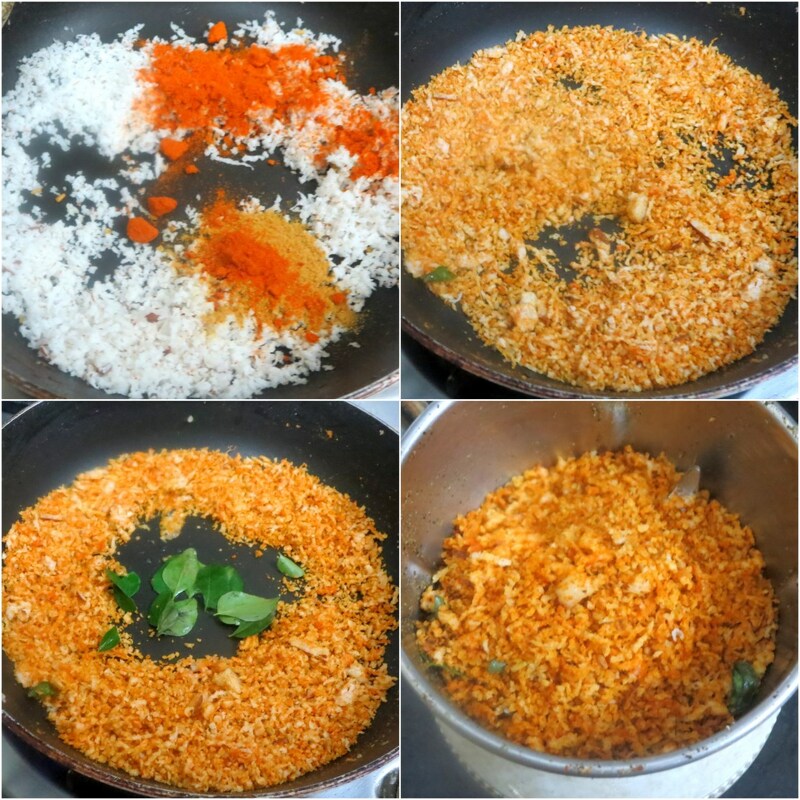 To make the Sambar Podi, heat oil and roast the grated coconut along with the ingredients mentioned under it. Grind to a smooth paste once it cools down. Now add the tamarind juice along with salt. You can add the cooked drumstick and potatoes at this stage. When the vegetables are getting cooked, add the dal. Enough water for the dal to get mixed well. When the dal and vegetables starts boiling; add the ground coconut mix, cook it in medium flame till the dal thickens. Ensure your dal is not very thick either. Heat oil in another small pan and splutter mustard seeds, fenugreek seeds, asafoetida and curry leaves and pour the tempering on to the sambar and mix properly. Add chopped coriander leaves. Cook for 5 - 7 mins in simmer.